This got us thinking about what Mayo Clinic might consider doing at the fair beyond this special Sesquicentennial appearance. You probably won't be surprised, but we had a few ideas. Below are some of our "suggestions" for what a future Mayo Clinic booth at the fair might offer. - Mayo Clinic Diet on a stick -- a portable dining delight that somehow manages to cram something from all but the top layer of the food pyramid onto one skewer stick. - The Landow Atrium Public Square Stage -- equipped with a priceless piano but also a platform for ukuleles, musical saws, small choirs and much, much more. 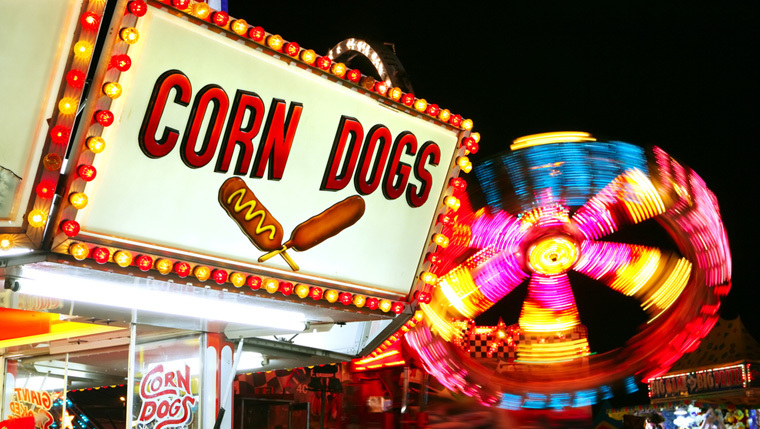 - Wellness coaches who will accompany you around the fairgrounds, shaking their heads at you while you eat. - Mayo Clinic veterinary medicine specialists making special appearances in the FFA Miracle of Birth building. - A before-and-after Guess Your Weight challenge staged near the Food Building. - A half-opened door showing you a glimpse into the future of your recent dietary choices. Clearly, the possibilities are as plentiful as calories at the fair. Feel free to add some tasty morsels of your own in the comments section below. You missed the Mayo Get Your Stomach Pumped exhibit to be visited just after visiting one or more of the food stands. Avoids the permanent installation of fat.